It was Chiefs quarterback Patrick Mahomes’ first true test: a “Monday Night Football” matchup against a defense powered by linebacker Von Miller. Mahomes passed with flying colors as he led Kansas City to a 27-23 win over the Broncos. 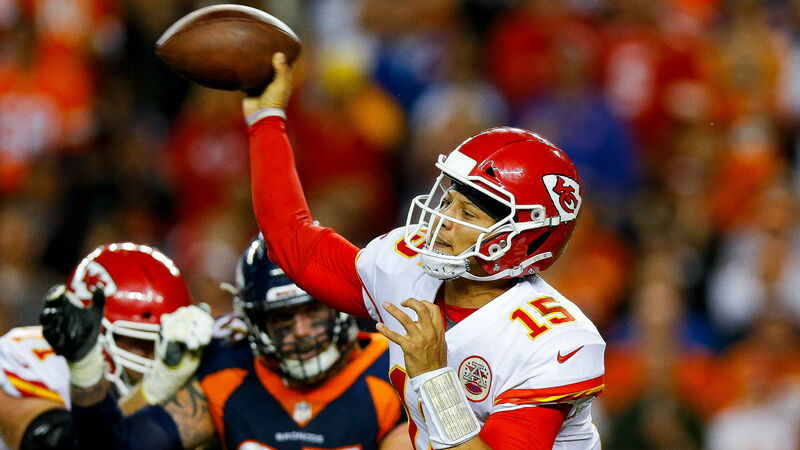 The undefeated Kansas City team benefited from the arm of Mahomes, who silenced a noisy crowd at Mile High Stadium on Monday night. It was the first time Denver had blown a 10-point lead at home since November 2004. Behind explosive plays from Mahomes and a run game that worked tirelessly throughout the contest, the Chiefs chipped away at a deficit that Broncos quarterback Case Keenum established late in the third quarter. Here are three takeaways from the Chiefs’ “MNF” win over the Broncos. The Chiefs’ defense entered play Monday as the worst in the NFL and they proved that was the case for much of the game, even though they were facing one of the worst scoring offenses in the league. Kansas City, which has allowed the most total yards of any team, couldn’t stop running back Royce Freeman or Keenum. Up to this point, Keenum struggled to click with his new offensive weapons as he entered the game with only three touchdowns and five interceptions. But he took advantage of the Chiefs struggling unit. Freeman helped open up the field for Keenum, who finished 21-of-33 passing for 245 yards with no touchdowns and one interception. The Chiefs defense, however, finally turned an uninspiring performance around in the third quarter when defensive back Eric Murray nabbed his first career interception and the team’s second of the season. While the Chiefs allowed 385 total yards, they applied pressure when necessary — like on Murray’s pick and the Broncos’ final drive that came up 19 yards short. The Broncos were undefeated in the Mile High City this season before the Chiefs visited. Those two matchups were won by a combined four points, proving the team is battle tested when it comes to being in close games late. In its last contest at home, Denver put together a late drive that ended with Brandon McManus kicking the game-winning field goal. This time around, a field goal wouldn’t get it done as the Broncos were down four points. The winning play instead went to the visitors, who set up their final scoring drive after a left-handed chuck from Mahomes. Kareem Hunt then ran it in from 4 yards out to put the Chiefs ahead for good. Mahomes didn’t look like his usual self, and with a hot and cold offense, Keenum didn’t look down the field much either. Both quarterbacks relied heavily on the running game as the teams combine for 301 rushing yards. The Broncos’ efforts were powered by the duo of Phillip Lindsay and Freeman. The Chiefs looked to Hunt and their play caller Mahomes for their yards on the ground. Lindsay, an undrafted rookie free agent, has been a steal for Denver. The 24-year-old from Colorado has now led the team in rushing in three of their first four games. On Monday night, he tallied 69 yards on 12 carries and a touchdown. Freeman finished with 67 yards and one touchdown on eight carries. Mahomes’ arm wasn’t on display for Kansas City for much of the night, so the Chiefs utilized second-year back Hunt to make up for it and he excelled against one of the best rushing defenses in the league. Hunt capped off a 121-yard night by running in the game-winning score. He finished with 19 touches.